If you use Church Community Builder for your church's management software, you can access the contact Groups and Saved Searches you have in Church Community Builder within your Call-Em-All account. The setup is simple and the steps are outlined below. Log into your Church Community Builder account. Click on System Settings and choose API. Click the Add a new API User button. Create a new API user, matching the information entered in the screen below. The password should be a strong password of your choosing. 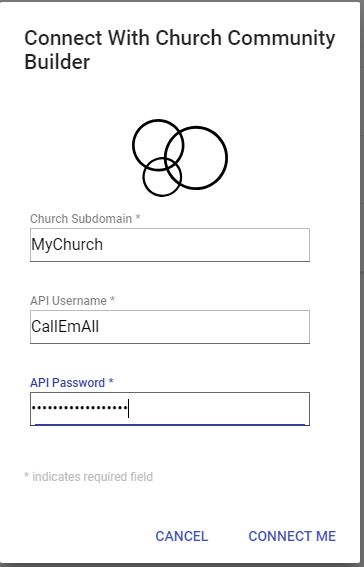 Please remember this password as you'll need it when connecting Church Community Builder within Call-Em-All. (Note: Enter CallEmAll for both the Name and Username of the new user). DO NOT CLICK SAVE! 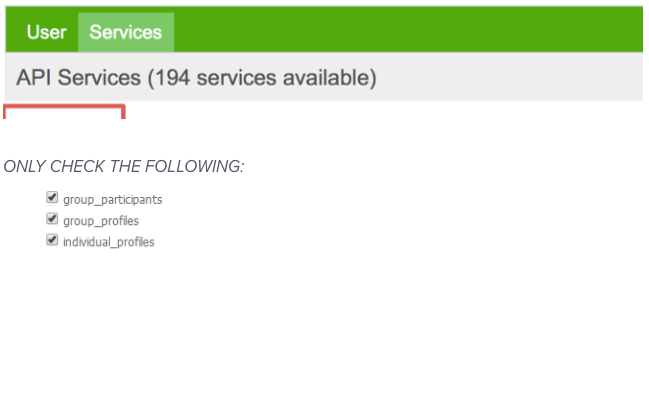 Click on the Services tab above the form and select the group_participants, group_profiles, group_profile_from_id, individual_profiles, from the list as seen below. After choosing these groups, click Save to create the user with the proper permissions. Saved Searches: If you want to be able to contact your Saved Searches from Church Community Builder, please select execute_search and search_list, as well. 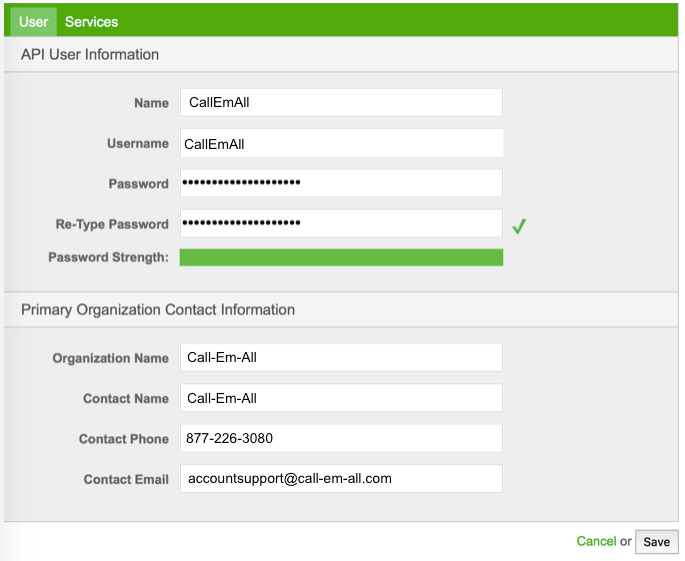 Log in to your Call-Em-All account using your Call-Em-All Username and Password. Once logged in hover over the name in the top right corner and click Settings. Then, click Integrations on the left side of the screen and click on Connect to the right of Church Community Builder to enter your Church Community Builder information. 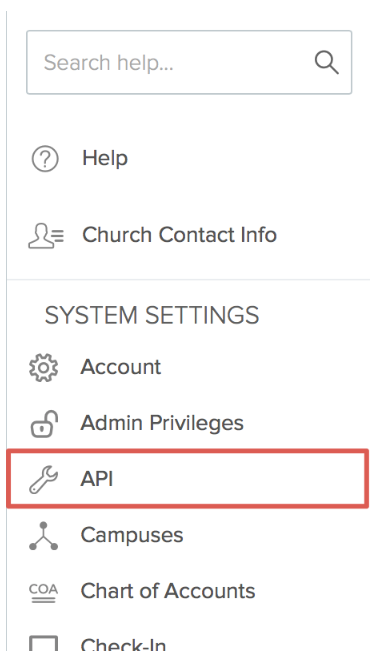 Within the box that pops up, you'll want to enter in the API User information you created within your Church Community Builder account. Be sure to enter your correct Church Subdomain which can be found when viewing the URL in your address bar when logged into your CCB account. The very beginning of the URL before the period is your subdomain (likely your church name). For example, if you see gracechurch.ccb..., you would enter gracechurch. Once verifying your information is correct, click on Connect Me. Once your groups have finished syncing, you are ready to create a broadcast using your Church Community Builder groups. 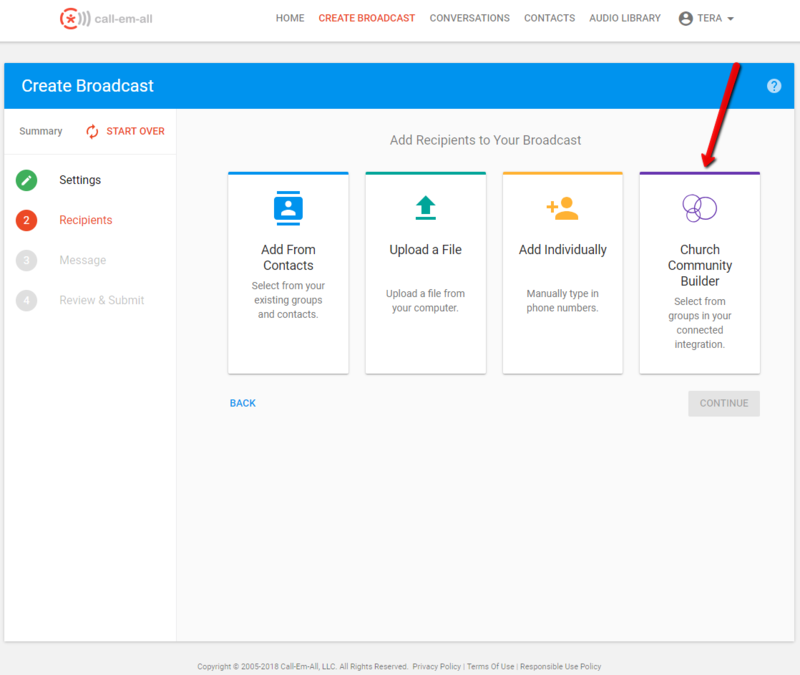 In step 2 of broadcast creation a new button will appear which allows you to choose contact from Groups or Saved searches within Church Community Builder. Click this button and choose any of the groups you'd like to include in the broadcast.